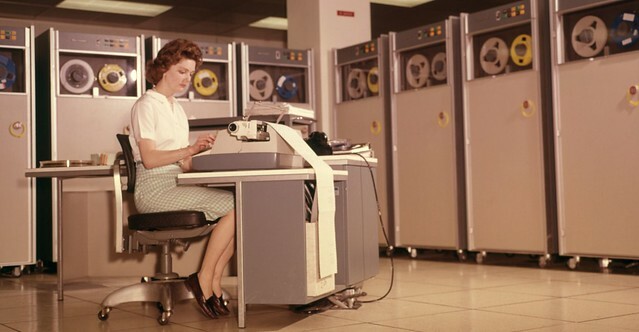 Named after George Bernard Shaw’s ingénue in Pygmalion, the ELIZA program operated on the Project MAC computer system at MIT and made natural language exchange possible between man and machine. ELIZA identified key words and phrases and responded with rote answers that simulated a conversation. “Talking Cure,” via Lapham’s Quarterly. As we lie back on the couch, we might note that it was on this date in 1928 that the Enigma Machine encoded its first message. A simple German machine the size of a portable typewriter, ENIGMA allowed for security in communications by a process in which typed letters were replaced by a cipher text displayed on illuminated lamps. The cipher was symmetrical so entering the cipher text into another ENIGMA reproduced the original message. Security was provided by a set of rotor wheels and a series of patch cables whose arrangement was agreed upon previously. 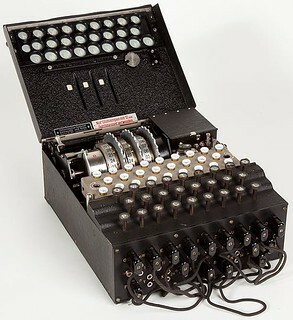 ENIGMA was used extensively by the German military during World War II to transmit battle plans and other secret information. By December of 1941, however, British codebreakers managed to decipher the code, allowing them to routinely read most ENIGMA traffic.